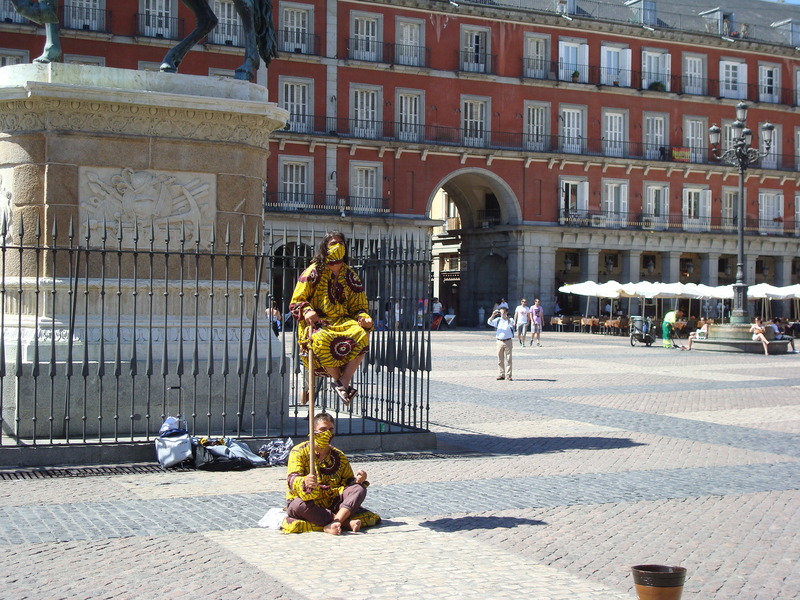 This week’s photo is of street entertainers performing in the Plaza Mayor. I could only marvel at the feat of strength and concentration being shown. There were plenty of street entertainers on view in the Plaza Mayor. Some better than others. Until the next time, stay safe, stay healthy and keep smiling. 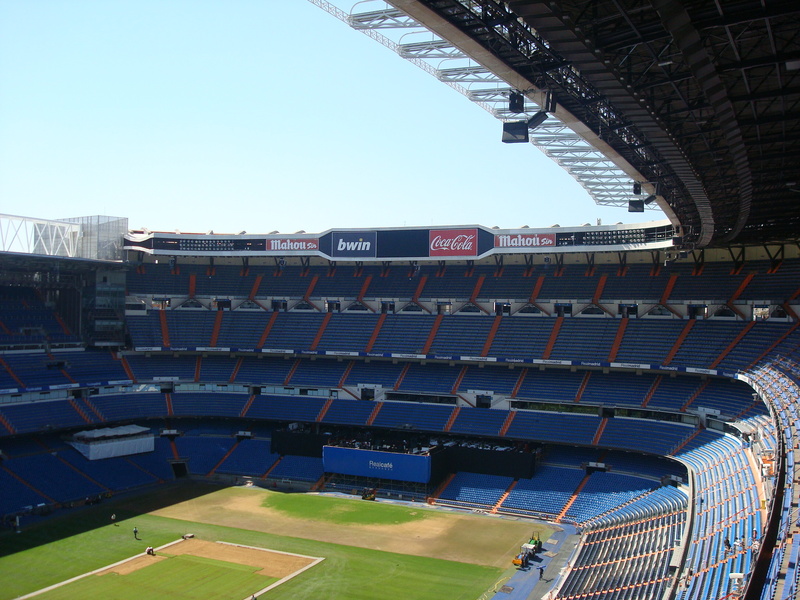 The Estadio Santiago Bernabéu is one of the most impressive sporting venues that I have visited. It is a cathedral to the beautiful game celebrating one of the worlds greatest clubs Real Madrid. The stadium capacity is 85,454. 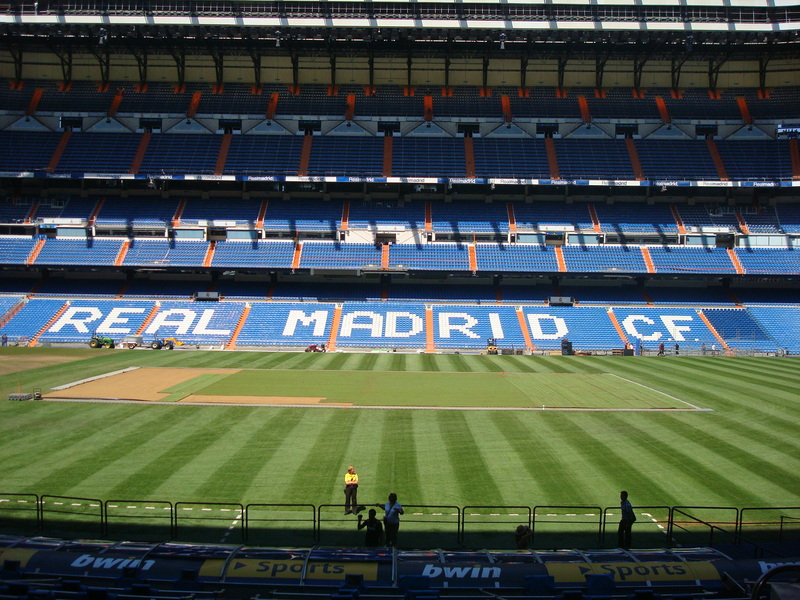 The stadium is named after former club player, manager and president Santiago Bernabéu Yeste. It was previously known as the Nuevo Estadio Chamartin until 1955 when it was renamed the Bernabéu. It was during his time as club president that he is remembered for. It was the time that Real Madrid became kings of European football by winning the first five European Cups. In total Real Madrid have been European champions on nine occasions and World club champions on three occasions. 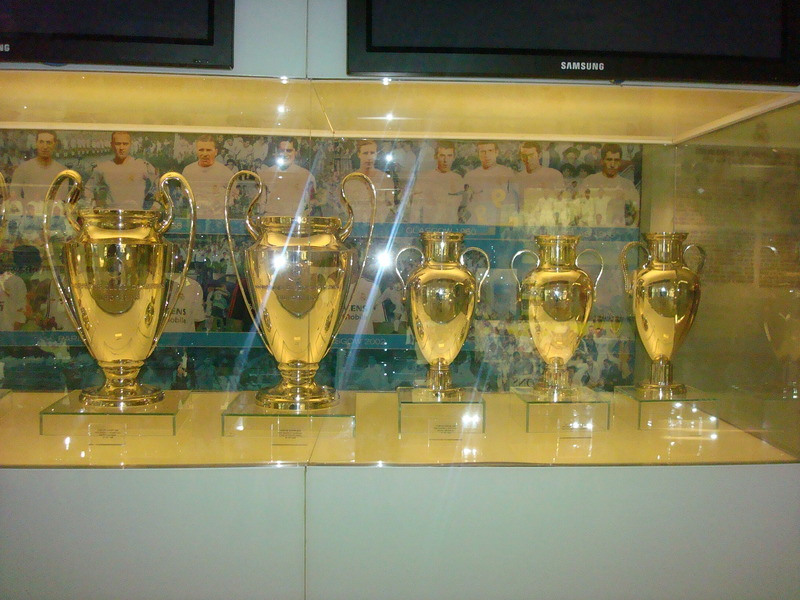 The trophies and replicas are displayed in the club museum. 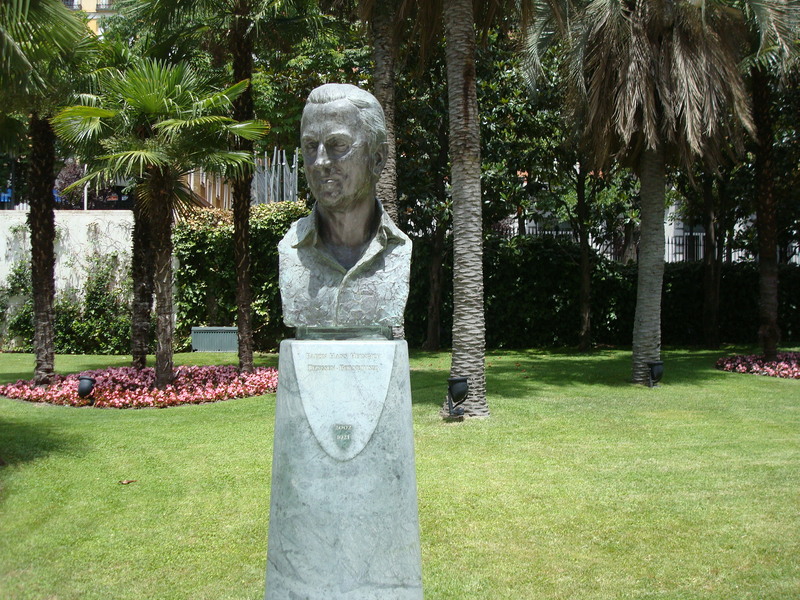 Real Madrid were considered to be the club of General Franco. This maybe down to Bernabéu fighting for the Fascists in the Spanish Civil War. In truth, Franco was no fan of football but used the success of Real Madrid to promote is vision of Spain at a time when the country was ignored by the rest of Europe. The reason to visit the Bernabéu is to take part in stadium tour. I was there just after Spain victory in Euro 2012 so the mood was good. You can only appreciate the stadium when is it empty. You start the tour by the grandstands and there you can marvel at the stature of it. Next you enter the museum. This is where you celebrate the rich history of Real Madrid. It is a celebration of all the club successes. Be it the trophies they have won or the individual honours achieved by the players. Each European success is celebrated individually. I would have liked to have seen more about the early history though I did enjoy the section which listed all the players who have played for the club. From the museum you go to the President’s Box. From there you head to the holy grail, pitchside. In particular the coaches technical area. Standing there I had visions of all the players that have trod on the hallowed ground and dreamt of giving orders from the sidelines. From the pitch I went to the away changing rooms. Nothing special there, indeed it is a little basic. Giving your opponents comfort is not part of the equation. Finally you end up in the press room. 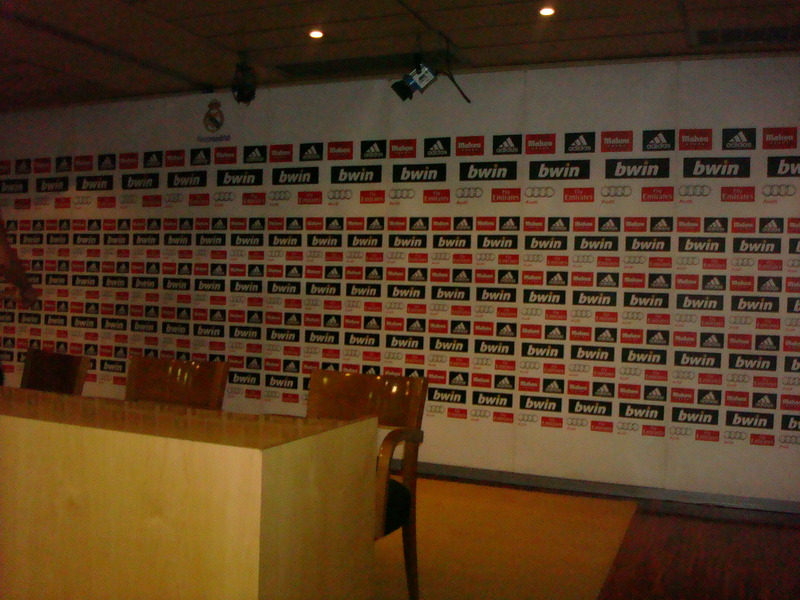 Befitting the size of Real Madrid it is a large room that has room for many journalists. I imagine that José Mourinho enjoys playing to that crowd. The stadium tour ends in the club shop which is a celebration to all things Real Madrid, Spain and Adidas. Lots of Euros change hands at this point. This week’s photo is bust of Baron Hans Heinrich Thyseen-Bornemisza. It is situated in the grounds of the Museo Thyssen-Bornemisza. As an industrialist, he made his fortune from steel and armaments. With his fortune he indulged in his love of art. He inherited a large collection from his father. He continued to add more paintings to the collection most of which are displayed in the museum which bears his name. 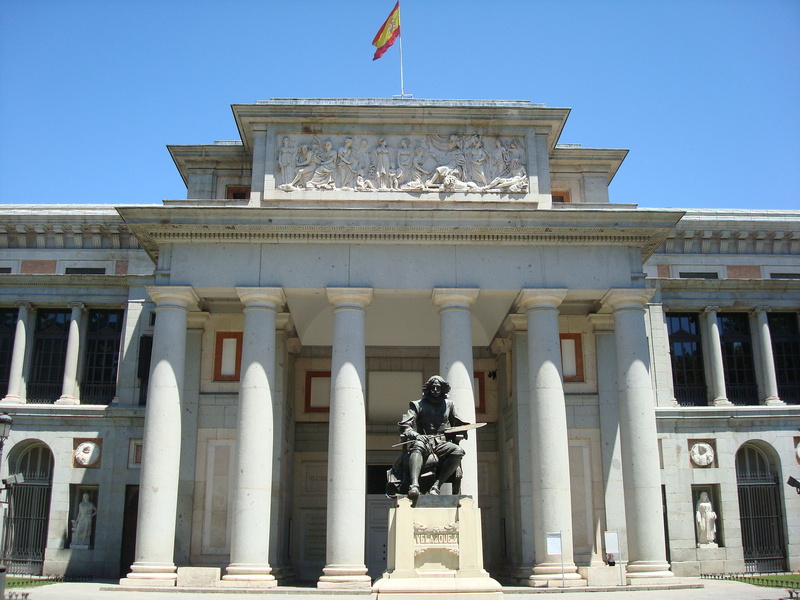 One of the first sights that I was recommended to visit in Madrid was the Prado National Museum. It is well-known by those who know me that I like to visit a good museum. I had read that the Prado was home to one of the best art collections in the world. According to Wikipedia it is the 11th most visited museum in the world. Holding a Madrid card meant that I did not have to pay an entrance fee and I could enter without having to queue at the ticket office. The Prado was initially set up as a museum displaying paintings and sculptures. Over the years other collections have been added. However, it is most famous for its extensive art collection. This dates from the 12th century to the 19th century. The paintings range from Spanish masters such as Velázquez and Goya, to Italian masters such as Raphael and Titian. There are also paintings from the Flemish masters. In fact there are paintings displayed from all over Europe. Sculptures date back to ancient Greece and Rome. The museum is certainly impressive not only in size but also with the collection it holds. This comprises of 7,600 paintings, 1,000 sculptures, 4,800 prints and 8,200 drawings. The museum itself displays 1,300 works. There are over 3,00o items that are out on loan to other museums. The best known work is Las Meninas by Velázquez. The importance of Velázquez to the Prado cannot be underestimated. Not only did he bequeath his work Velázquez was also responsible for the collection of Italian masters. My personal highlights were the collection of art. I may not know one end of a paintbrush from another but I like to think that I know what constitutes a work of art. Favourites were ‘The Fall of Man’ by Titian and ‘Third of May’ by Goya. As a museum I would certainly rank it alongside the National Gallery in London. There is so much more to see and enjoy. You can only marvel at the range of paintings. The beauty is simply breathtaking. I would recommend that you purchase a audio guide to complement your visit. Overall, a visit to the Prado is a must when you visit Madrid and I cannot wait to go back again. 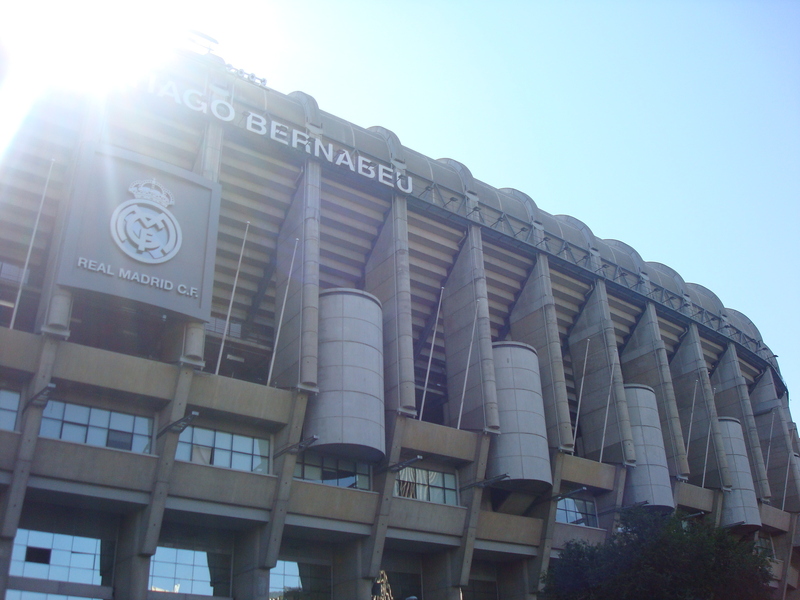 This week’s photo is of the Bernabéu Stadium, home of Real Madrid. I would not normally include myself in a photo but this is a perfect way to highlight the impressive stature of the stadium. A full review will follow later. Until then stay safe, stay healthy and keep smiling. 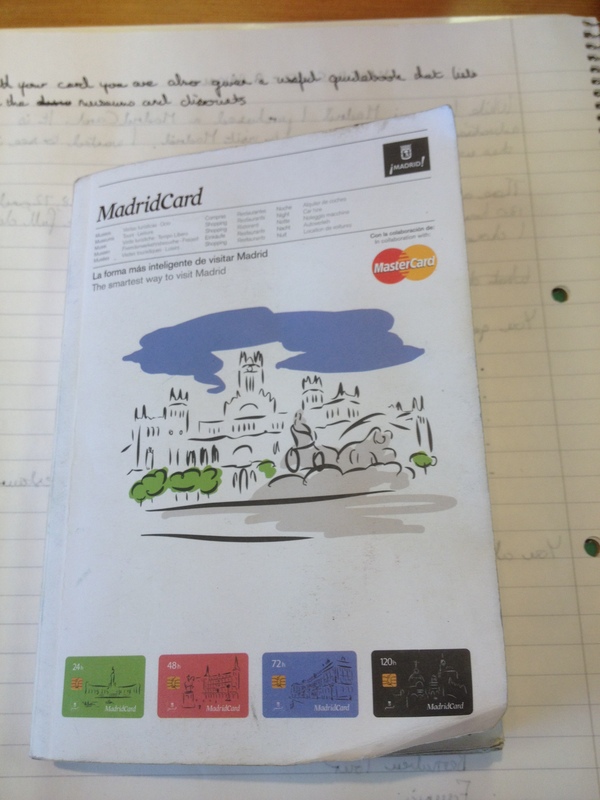 While I was in Madrid I purchased a Madrid Card. It was advertised as ‘the smartest way to visit Madrid.’ I wanted to see if this was true. There are four versions of the card available. 24 hours costs €39, 48 hours costs €49, 72 hours costs €59 and 120 hours which costs €69. Further savings can be made if you purchase online. 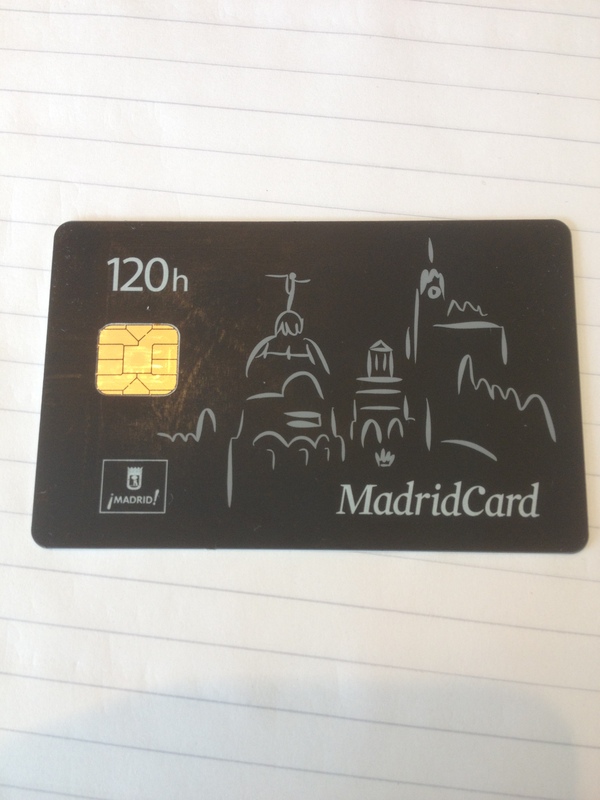 As I was staying in Madrid for five full days I chose the 120 hours card. Over 50 of the city’s museums and monuments. Guided tour based on the ‘Discover Madrid’ theme. Bernabéu and Atlético de Madrid stadium tour. Discounts on various tourists attractions, shopping, restaurants, nightlife and car hire. This means you avoid the long queues to these popular attractions. With your card you are given a useful guidebook that details all the attractions and discounts available. Your card becomes activated once you first use it. It is also important that you sign your card. Is the card worth the money? I have to say that I found it to be excellent value for money. Just using it to visit the major attractions I found that it had paid for itself in no time. The discounts on restaurants can be particularly useful for those travelling on a budget. I recommend the discount for the Hard Rock Cafe. By showing your card you can have a set three course meal for €20 which I found excellent value. There is so many discounts on offer that you will have to make a return trip to Madrid to take advantage. Overall, whatever card you purchase it represent excellent value and makes sense if you are travelling on a budget. 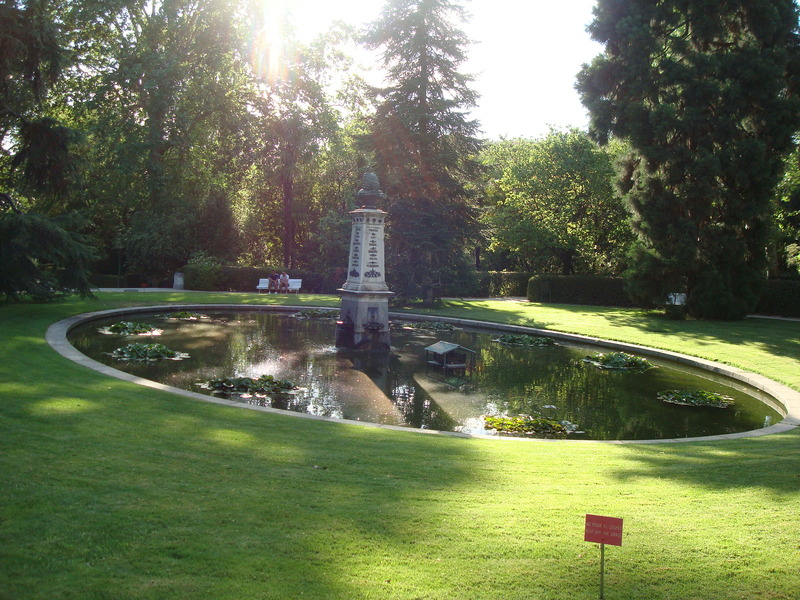 This week’s photo is from the Real Jardin Botánico de Madrid. 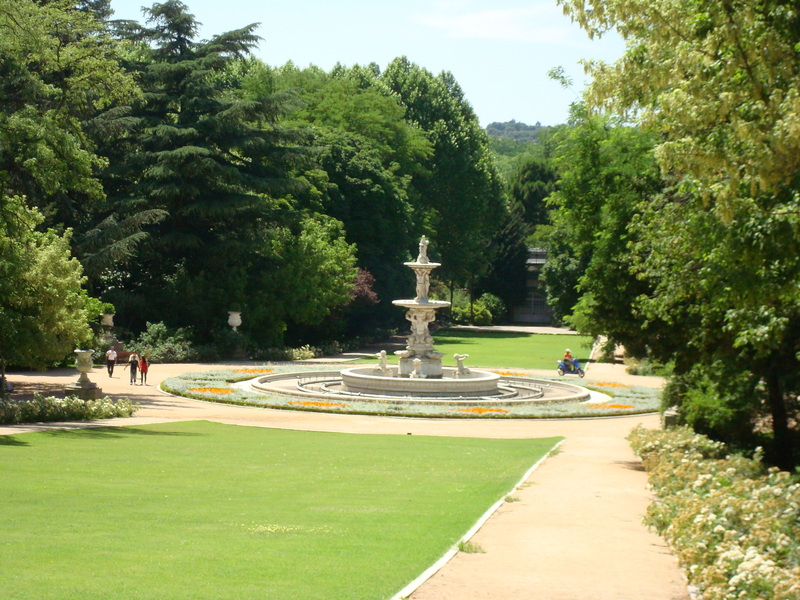 Situated next to the Prado Museum, the gardens date back to 1755. The gardens have three outdoor sections and two greenhouses. There are over 30,000 plants and flowers and over 1,500 trees. I spent a pleasant Saturday evening in the gardens. A great way to escape from the hustle and bustle of Madrid. I have been back in the UK for three weeks from my trip to Madrid. This has given me time to reflect about the trip. I have to say how lucky I was with timing. 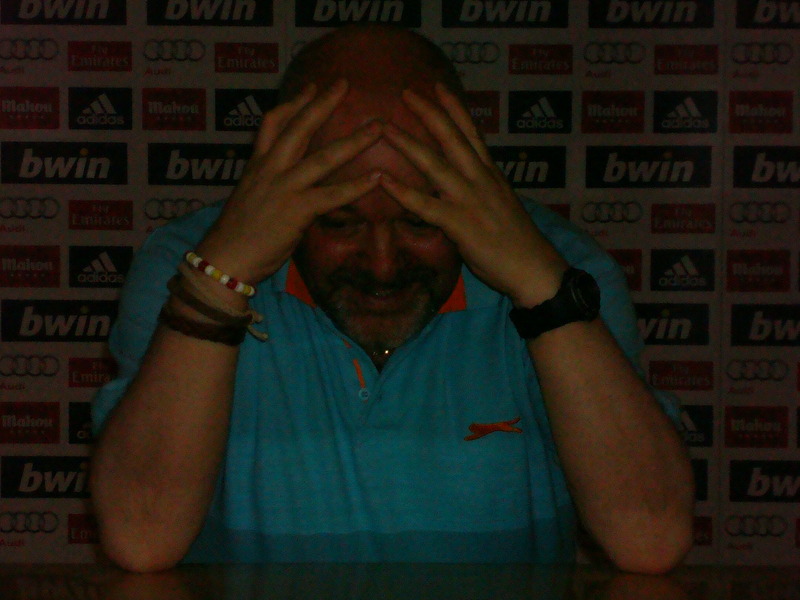 Being in Madrid at the time of the Euro 2012 final meant that I say a city that was feeling triumphant and happy. You would not have known Spain was suffering a big recession. Hopefully, we in the UK can follow that same attitude. Secondly, Madrid is a beautiful city. Highlights were the Plaza Mayor where I could witness events going on around me. In my eyes it represented the best of Madrid. The museums and palaces where interesting places to visit. So much history to witness. The only trouble was that there was so much I missed. Still, it is an excuse to come back again. Then there were the gardens. These were haven were I could go to rest and reflect about Madrid. Thirdly, I was lucky with the weather. No, I will rephrase that. The weather is what I expected. Hot and dry. It felt good to walk in the sun. I know the UK was experiencing extreme wet weather. I could only chuckle to myself when I saw the news. Finally, as a city Madrid was alive and vibrant. The nightlife seemed to be never-ending even on a weekday. So many bars and restaurants. Again, so many that I did not get chance to try out. Another excuse for me to come back. To sum up would I recommend Madrid? You bet I would. It has everything for those looking for a weekend break and the seasoned backpacker. I cannot wait to go back. I woke up in the morning with a sense of dread. 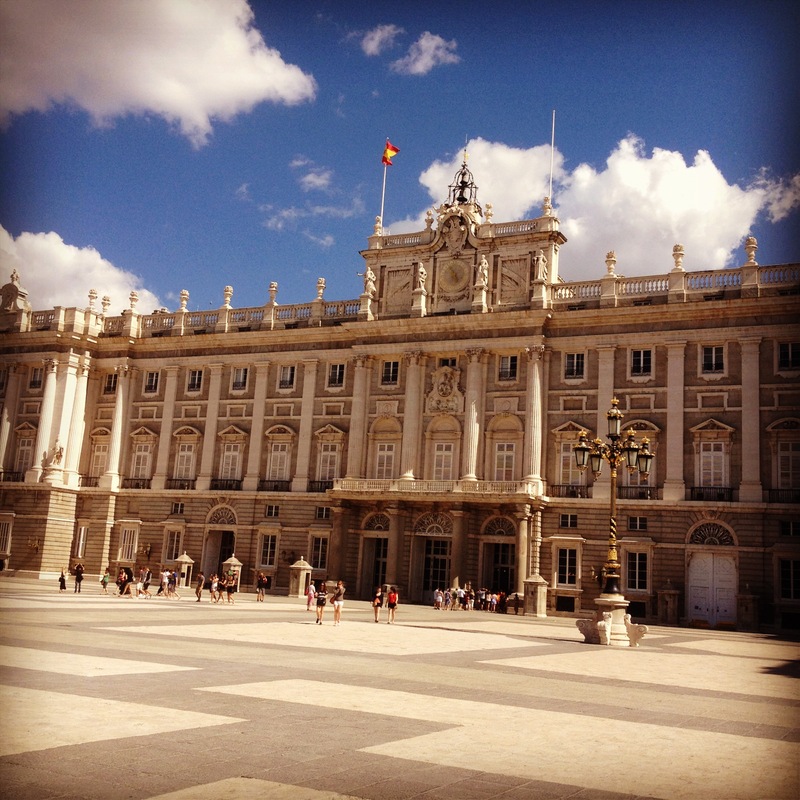 My last full day in Madrid and the sinking feeling in the pit of my stomach about going home. However, there was one place that I wanted to see. That was the Estadio Santiago Bernabéu, home to Real Madrid. 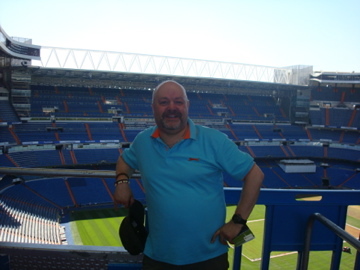 Not that I am a great of stadium tours I do recognise that Real Madrid is a great club with a lot of history. Also it was free due to holding a Madrid card. Spain was still buzzing from victory in Euro 2012 and that was felt at the stadium. The tour itself was excellent. 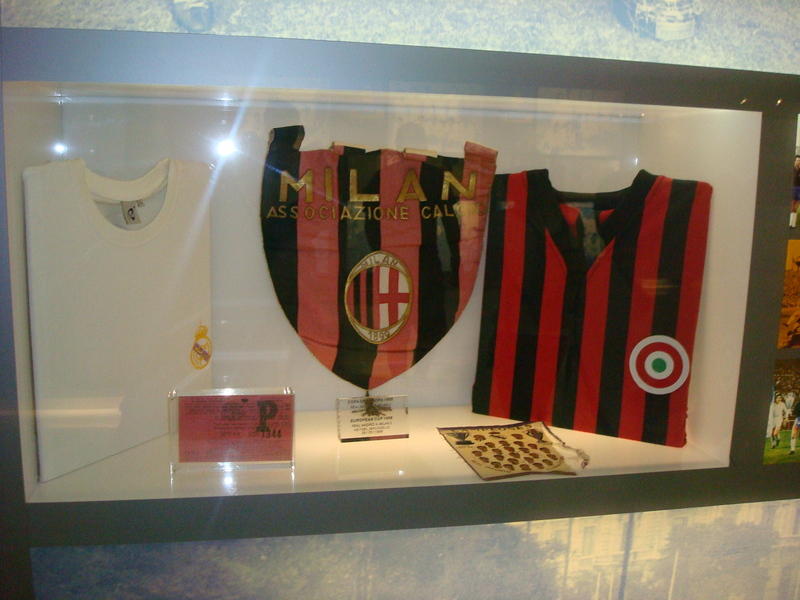 In the tour you see the museum which celebrates the victories in the European Cup and La Liga. Also individual awards are honoured even if the players were not playing for the club at the time. You then move towards the President’s box and get the view from there. Afterwards you move to pitchside and the chance to sit in the dugout. For some reason you were not allowed to visit the home dressing room but I the away one. The ends in the club shop and this is a moment parents must dread. I saw a lot of people purchasing club merchandise. After the tour I made my way back to the hostel. There I met up with the people I was speaking to last night. We decided to have lunch in the Musee de Jambon. A place dedicated to all things ham. There are several of them to be found in Madrid. My lunch was the last to arrive. That will teach me to order beef in a restaurant dedicated to ham. After resting I was talking to a group of Australians. They were all looking forward to the bull runs in Pamplona. Again that feeling of going home began to strike home. Oh no, I’m going home tomorrow. So I made a decision to partake in the hostel pub crawl. As my coach tomorrow would not leave until 16:30 I thought I can shake off any hangover. It turns out that I made the right decision. It was an excellent night. Free beers, free entrances to three clubs with a free shot. Madrid’s reputation for nightlife is justified. Guess what? I was not drunk at the end of the night. An excellent way to end my final day. For my trip to Madrid I chose to stay at the No Name City Hostel. This was booked through http://www.hostelbookers.com and was chosen because the location was central and the reviews on the website were positive. 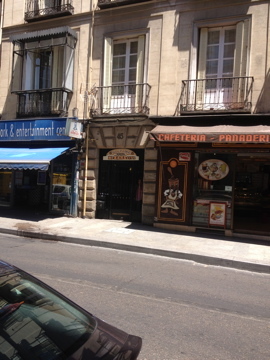 The address of the hostel is C/Atocha, 45 – 28012 Madrid. The nearest Metro stop is Antón Martin on-line 1. 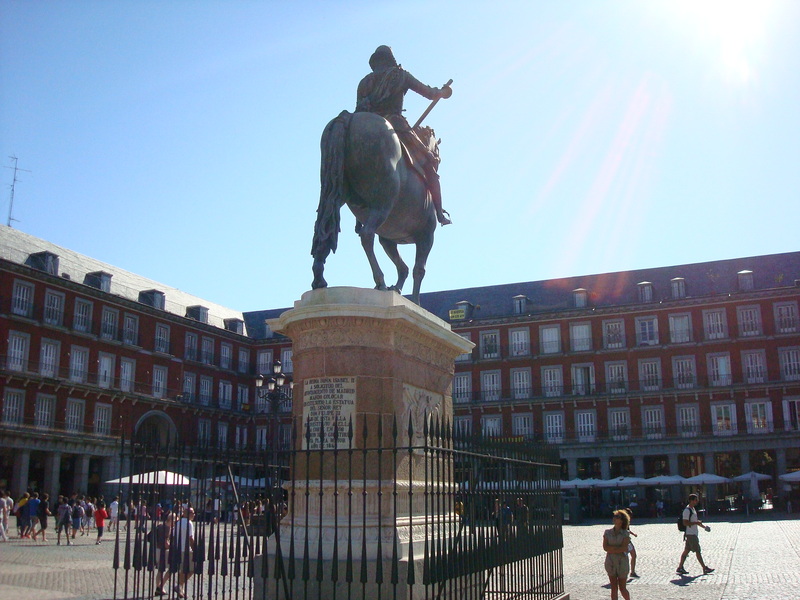 Plaza Mayor is only a fifteen minute walk away. I had booked a dorm with a private bathroom. However, on arrival I was told that I would be in a dorm where I would have to share bathroom facilities with other dorms. To be fair the hostel without prompting discounted €1 per day off my bill and having to share a bathroom is not the biggest hardship in the world. You are assigned your bed with your key so you do not get the choice of upper or lower bunk. You also have a key to safe under your bunk. I also left a €15 deposit when I checked in. It would be paid back to me when I checked out if I brought down the bedding. The dorm itself was clean and spacious for six people. The bed itself was comfortable and I managed to sleep well on all six nights. Breakfast was included in the cost. It consisted of fruit, cereal and toast. You could also have a juice and a hot drink. It is served in the Common Area. There were also vending machines that sold food, soft drinks and alcohol. There is also access to free wi-fi which is always a bonus. There is a kitchen where you can cook your own meals on the third floor. Where I felt the hostel scored really well was the multitude of events that it organised. The most popular was the nightly pub crawl. I took part in the crawl on my last night. For €12 you meet at another hostel and have two free beers and make your way through the exciting Madrid nightlife. You stop at three nightclubs where you get a free shot in each one. An excellent night out. Also on offer were a Tapas tour, Walking tour and Flamenco night out. Overall, I found the No Name City Hostel an excellent place to stay. Central and comfortable it offers plenty to the traveller who wishes to enjoy Madrid. I recommend it to everybody.